HIROSHIMA is one of the best known instrumental ensembles in the world, pioneering a unique East meets West approach since the late 1970′s. The group seamlessly blends Asian and North American culture to reflect both cultural and spiritual connections. 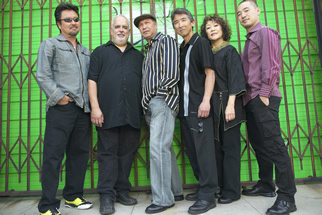 It has been over 25 years since the band’s unique combination of distinctively Japanese elements-June Kuramoto’s classical flavored koto, Johnny Mori’s booming taiko drum-with funky pop, urban and jazz sensibilities first hit the instrumental music charts, and 30 years since saxophonist and East L.A. native Dan Kuramoto, along with June, first formed the ensemble. Throughout the years, Hiroshima has performed for crowds of hundreds of thousands of people, and sold over 3 million copies of their albums. While the band was originally founded as a jazz ensemble, they have steadily moved towards new age music and still continued to gain traction among audiences world-wide. The latest album is Legacy, a celebration of their 30th year in the recording industry. It is the first installment of what is expected to be a series. This initial album in the series is primarily a re-visitation of songs from the band’s first decade. Essentially recorded live at studio Tofuville, it features the six band members along with guest artists.